No one is sure when ballistas appeared. The Assyrians in 800 BC certainly didn't mention them and they loved showing siege equipment in their records. However they definitely were used by Syracuse against Carthage around 400BC. By the time of Phillip [360BC to 336BC] and his son Alexander the Great [336BC to 323BC] records and descriptions are quite detailed. The first Ballistae were just giant bows on a tripod which had to be winched back. In fairly quick course the bow was replaced by 2 arms each held in a 'skein' of twisted rope. Note the Greeks may have used leather or sinew instead of rope. Smaller Ballitae fire arrows while larger ones can fire rocks or spears. Ballistae can fire 400 m possibly 500 m and any that can't shoot 300 m [ i.e.. bow range] are useless. It is a Ballista's ability to stand back safely out of bow range and slowly whittle the enemy down that is its great advantage, also having 3 of your friends unexpectedly impaled on one javelin next to you can have a dramatic effect on your morale. The maximum weight of projectile is open to interpretation but a 4 kg rock to 500 m is easily attainable with as much as 30 kg rocks to shorter distances being mentioned. These will not do much to a castle wall but will mess with the battlements and destroy most wooden palisades. Your personal armour and shield is irrelevant [as is the guys behind you]. To achieve maximum accuracy and effect rocks must be spherical. Sometimes smaller natural rocks were baked in clay balls. While not a effective they were quicker and cheaper to make and as the clay shattered on impact could not be thrown back by the enemies engines. Note average rate of fire is 2 shots per minute [small ones more, big ones less]. Roman ballistae had a similar performance to greek ones but where lighter, stronger and easier to maintain. Romans often mounted small ballistas on carts making for a mobile artillery force. In the Dark Ages and Medieval period Ballistae continued to be used but as they are complex to make they were much less common and probably less effective. They fell out of use as fortifications improved. The term Catapult here refers to single arm rock throwers using twisted rope to provide torsional power. They have the same history as ballistae being basically a similar device but appear to have been much less popular. Catapults are simpler to make and can be made much bigger thus hurling larger rocks further. However they are an awkward shape to carry round or mount on walls. Larger individual parts mean that even disassembled the are inconvenient to move. Ballistae have no recoil while Catapults have a large 'kick'. The Roman word for catapult is onager which means donkey. A large recoil means they need a good earthen foundation, a brick wall would be quickly shattered. Also the recoil of a catapult moves it slightly which is bad for accuracy. Most importantly Ballistae can be easily, quickly and accurately aimed at a specific target while catapults cannot. Ballistae have a low trajectory thus tending to mow down rows of troops while catapults have a high trajectory tending to squish one guy very badly. Catapults are not much use on a battlefield [with a couple of exceptions] but are best against walls. 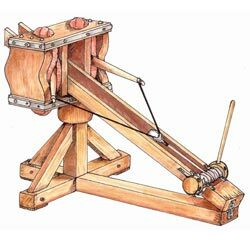 Maximum range for a catapult might be as much as 750 m but 450 to 500 m is effective range. 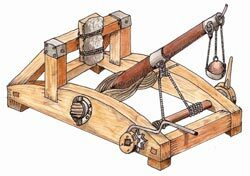 A large catapult can lob a rock about 80 kg in weight. This will cause some structural damage but to really have an effect you have to get within 150 m which is not heathy for the crew. Catapults from the ancient period have a sling while medieval catapults all have a solid arm and cup arrangement. This greatly reduces the range and effectiveness. Why the sling disappeared is a mystery. The only reason I can think of is that early medieval and dark age fortifications and buildings were largely wood and thus vulnerable to fire. Flaming missiles cannot be launched easily from a sling [Kingdom of Heaven take note]. The term here applies here to engines using a long lever and counterweight. Seem to have only appeared in the 1200's [AD]. Earlier versions from asia were operated by having large numbers of people pulling on ropes instead of a counterweight but while very simple to build one must question their effectiveness. Trebuchets quickly replaced catapults as being counterweight operated they were much simpler to build [experience or mathematical knowledge is still required but not so much technical skill]. Also they can be made much larger, instead of an 80 kg rock modern reconstructions can launch a 140 kg rock easily. More interesting is the frequent historical references to lobbing dead horses which weigh 500 kg. Please note that modern reconstructions are greatly limited by the unavailability of large trees. One Genoese machine is clearly specified as throwing 600 kg though this was clearly an exceptional device. The most unusual projectile was in the siege of Delhi in 1296 AD when a persian general lobbed bags of gold into the city to inspire a revolt. It worked! Even if a trebuchet could not destroy a wall it could send the defenders scurrying for cover or give them the excuse they were often looking for to surrender. When King Edward I built a large trebuchet the defenders of Carlisle took one look at it and surrendered [Edward refused to accept the surrender until he fired off one shot with his new toy]. Also you only need to knock down the top half of the wall to make it scalable. Trebuchets while effective were massive and immobile having to be built on site. Even the version on wheels with a fixed counterweight [if it existed] wasn't going far. 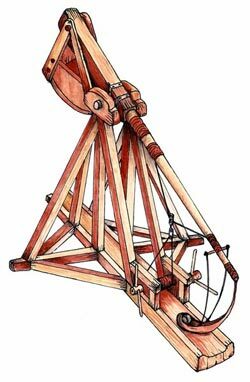 Thus while the Romans would bring a hundred catapults against a town, medieval sieges [including Jerusalem] mostly had one trebuchet. King John reputedly used four in his siege of Bedford but he was in a very angry! Only very rarely were they used by the defenders due to lack of materials and room. The last known use of the Trebuchet was was in 1521by Cortes against the Aztecs. Running short of cannon ammunition one of Cortes men made a Trebuchet but obviously the know how to make such devices was thin on the ground for its first shot went vertically and down destroying the machine completely.